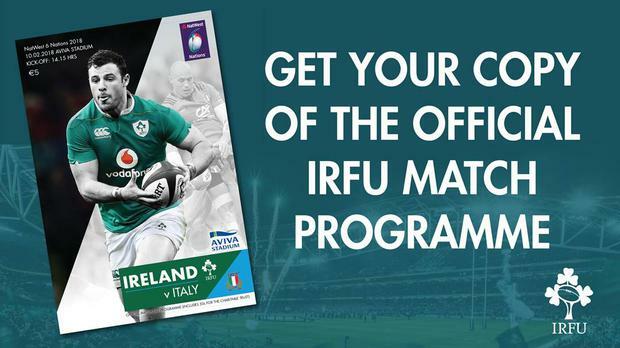 Fans attending Ireland vs Italy this afternoon can get a copy of the Irish Independent when they pick up the official IRFU matchday programme. As well as enjoying the Irish Independent's great rugby coverage - with opinion and analysis from Alan Quinlan, Tony Ward and Ruaidhri O'Connor - supporters will also get a free double-sided Six Nations poster featuring the Irish men and women's teams. Joe Schmidt's side take on Italy at the Aviva Stadium at 2.15pm while Adam Griggs' outfit play the Azzurri at 1pm in Donnybrook Stadium tomorrow.